I’ve never seen a truly blue Texas bluebell (Eustoma exaltatum), although I have found the flower, also known as the showy prairie gentian, dressed in pale lavender, purple, and white. Often, the colors will combine in a single flower. When I recently discovered a small group of white bluebells on a hot and steamy Texas afternoon, I couldn’t help smiling. Even in the heat, the flowers seemed crisp, cool, and elegant: the very opposite of their human admirer. Anyone who can stay crisp, cool, and elegant in the hot height of the Texas summer isn’t outdoors. Isn’t that the truth? I try not to sweat it, but it doesn’t always work. Your photography takes my breath away. It’s so pure and elegant. What a nice thing to say, Jeanie! I appreciate that, a lot. I do love white flowers, and when I find some that are uncommon, I’m always doubly pleased. Very pretty! Flowers have a way of keeping their own persona under very difficult conditions. And I know you’ve noticed that some of the flowers that appear most delicate actually can be quite sturdy. These bluebells helped me learn a new lesson, too. Four days after I first found them, I returned to the spot to take more photos. I was amazed to find that sunshine and rain had encouraged the surrounding grasses to grow so tall, the flowers barely were visible. I knew grass could grow fast, but a foot or more in four days? That’s really something. Ha! The last sentence has me laughing, but the image is stunning. It reminds me of another flower whose name escapes me at present. So much potential in those buds. Actually, that last sentence has me laughing, too. I know what I look like with sweat dripping down my chin, and elegant isn’t the word for it. The buds remind me of morning glories, or even an iris. They’re as attractive as the flower, I think, and pretty in every single stage. They open quickly, too; overnight can take them from this stage to full bloom. 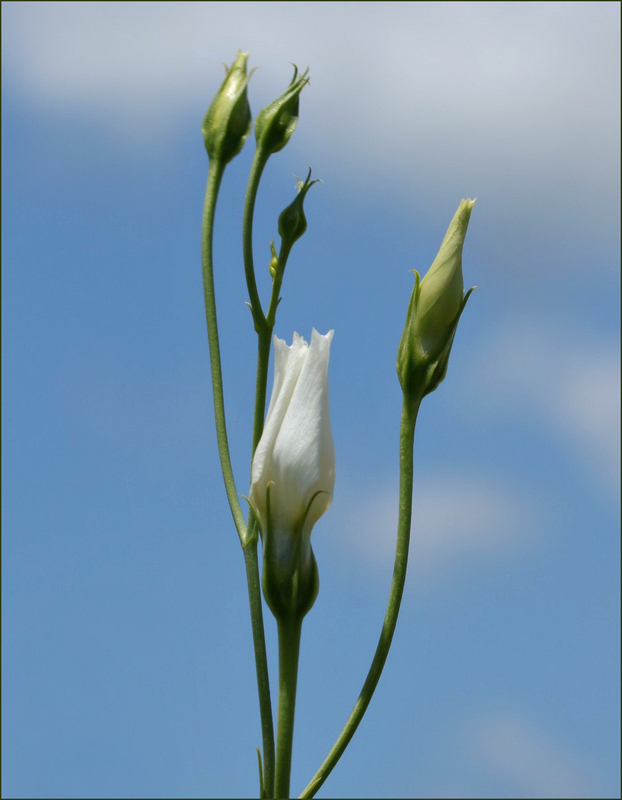 When I went back to the Wildflower.org page that I linked up above, I found that two synonyms for the flower I show here are Eustoma grandiflorum and Eustoma russellianum. In short, this plant and the one it reminded you of are the same plant. No wonder they look so similar! He did. There’s always something new to discover, isn’t there? Elegant is the word that popped into my mind the second I saw this shot. It’s a good thing the cameras aren’t affected by their operators – – my shots would look like that Salvador Dalí painting “The Persistence of Memory” with the melted clocks. That’s funny. Did you know that a Jimmy Buffett song (“La Vie Dansante”) draws on that imagery, too? The line is, “see the time melting off of the clocks,” and Buffett credited Dali for the inspiration. Sometimes I’m not sure who was operating my camera, but at least I seem to be past the point that it’s Bill the Cat. :) Did you see Dalí in the news recently, they had to bother him for a DNA sample, for a paternity suit, and while they had him topside, they checked on his mustache? That seemed a bit surreal, so I guess he’d be pleased. Cool and elegant were my thoughts as I scrolled down the page… Very nice image! Thanks, Lisa. One of these days I’ll show some of the lavender, too, and the multi-colored, which are really attractive. Very finely done, Linda. So beautiful. Thank you, Pete. One of these days I’ll show one or two bluebells with little legged visitors on them. You captured it perfectly, Linda! It’s such a pretty flower, and who doesn’t like something pretty to look at? Thanks for the kind words, GP. Unlike my poor tomato plant, which finds a way to wither even in an Illinois summer! Beautifully captured, Linda. Feast or famine, I guess. We had an early end to the tomato crop because of too much rain, and I talked to a friend today whose garden has just shriveled up for lack of rain. Even with watering, she couldn’t keep it going. So — on to the fall gardens for us, and the grocery store for you, I guess. So graceful! Thank you for clarifying what the famous Texas bluebell is, and the link was good, too. Look at the exchange between eremophila and me, up above. I’d never heard the flower called by the name Lisianthus — but now we have that sorted out. A couple of gardening sites I read talked at length about the difficulties of growing the flower. I was puzzled, and then realized that one person was writing in Illinois, and the other in Michigan. It certainly proves the point about the advantage of using native plants in a landscape or garden. The USDA map shows the bluebell absent in both Illinois and Michigan. I would not have taken these for bluebells. They look like morning glory buds, or maybe magnified bindweed buds. They do have that morning glory/bindweed bud look to them, don’t they? Of course, the fact that they’re white probably helps to keep “bluebell” off the initial list of possibilities, too. The first white ones I found were on Galveston Island, and it took me forever to figure them out. Of course, at that point, I’d never seen any kind of bluebell, so that didn’t help. As a matter of fact, I lived in Texas for some time before I realized Blue Bell ice cream was named after the flower, which was a favorite of the original owner. There. I’ve done it. We couldn’t have a Texas bluebell post without mentioning Blue Bell! Beautiful shot of the white bluebell. I’ve seen the bluebells growing here in my county in road side ditches. They are not very common but I am seeing more for the past few years. I believe that at one time they were on the threatened or endangered list. But I might be wrong about that. You’re right. They were in decline in some areas because they’re so pretty people were picking them like crazy rather than letting them be so they could reseed. I vaguely remember reading that some areas had a casual little campaign to educate people about not picking wildflowers, and it seems to have worked. I’m glad they’re increasing for you. They are a pretty flower — one of those that makes me smile every time I see it. I remember that you like white flowers, too. Didn’t you get a nice white arrangement for your birthday? I’m going to show more of these, because they’re delightful in all their forms. The white with purple centers are especially nice. Don’t feel you have to comment, by the way. I always love it when you do, but sometimes that little “like” button is easier. Thanks for your caring understanding Linda. I appreciate your friendship. I love stargazer lilies, but I am horribly allergic so once when I received an enormous arrangement, we put it outside in front of the window to enjoy after dividing it with a friend. I am blessed! Ah, yes. August. The month when Paris and Texas have the most in common: everyone capable of fleeing, does. Of course, the tendency to open schools earlier each year makes it hard for some, but there always are the theaters and malls for those who have to have their air conditioned. In the meantime — many of the flowers flourish. We were in Reno this morning and schools are already in session there. Soon it will be year round Linda, and those wonderful lazy days of summer that we enjoyed so much as children will be lost forever. From what I’ve seen in the news about Montana and Idaho, leaving during fires is all to the good — unless, of course, you have property to protect. Hard decisions all around. But school starting in mid-August? I could wring my hands about that, except that too many kids spend their summers in the AC with their devices now, so school might be the better option. Good for you, and good for them. Have fun! What a beautifully composed image. Thanks, Vicki. I do like the coolness of the blue and white, but I like the way the curve of the stems is highlighted, too. It’s fun to show off such a beautiful flower. Never mind elegance. Sometimes it’s hard to maintain presentability. Hyacinth Bucket never would approve of us, I fear. Neither of us worries overmuch about keeping up appearances!